Stacey LaRiviere ’17L for the Commonwealth Jury trials for both civil and criminal cases are increasingly rare, especially for law students. But 3L Stacey LaRiviere got the chance to try a case before a jury while working for the Roanoke City Commonwealth's Attorney. Stacey LaRiviere in W&L’s new mock trail court room. Jury trials for both civil and criminal cases are increasingly rare, as lawyers and litigants often choose settlement to avoid costly trials and unpredictable outcomes. As such, it is even more unlikely for a law student to argue a jury trial. Few have had the opportunity in the past two decades, but that is exactly what third-year law student Stacey LaRiviere got the chance to do. LaRiviere is a graduate of The College of William and Mary, where she majored in government. A member of the Student Assembly, Stacey served as the Secretary of Public Affairs, where she lobbied the General Assembly and the local city council on issues important to the college. Named a Governor’s Fellow for the Commonwealth of Virginia, LaRiviere served for the Secretary of Public Safety. She has long been focused on a career of service to the Commonwealth through the law. LaRiviere got her first taste of courtroom experience this fall as part of W&L’s prosecutor externship program led by Adjunct Professor and Buena Vista Commonwealth’s Attorney (CA) Chris Russell. LaRiviere spent two days a week in Roanoke City’s Commonwealth Attorney’s Office last semester. Using her third-year practice certificate, Stacey tried misdemeanor cases, bond hearings, and preliminary hearings in felony cases in general district court, and conducted bond appeals in circuit court. Then, late in the semester, Stacey was assigned a case involving petit larceny, third or subsequent offense, a felony charge. She had about two weeks to prepare for trial. The store where the theft occurred no longer had video evidence. Emboldened by this development, the defense attorney requested a jury trial. However, a pretrial motion by the defense resulted in sentences for the defendant’s prior petit larceny convictions to be redacted. A jury was empaneled and sworn, and LaRiviere presented the Commonwealth’s evidence, including eye witness accounts from the store’s loss prevention officer. After the defendant elected to testify in her defense, LaRiviere was able to elicit self-incriminating statements from her on cross-examination. The jury returned a unanimous decision for the prosecution, taking about an hour to decide the guilt phase of the case. LaRiviere has focused her legal education on gathering as much trial-related experience as possible. She has taken classes in evidence, criminal procedure, criminal regulation and vice, and Virginia law and procedure. In addition, she has taken a number of practice simulation classes covering appellate advocacy, trial advocacy, and advanced family law. She currently serves as Senior Articles Editor on the Journal of Civil Rights and Social Justice, Vice Chair of the Moot Court Board, and Co-Chair of the Pro Bono Board. Upon graduation, LaRiviere will be a judicial law clerk for Rossie D. Alston, Jr., a judge on the Virginia Court of Appeals, in Manassas, Virginia. 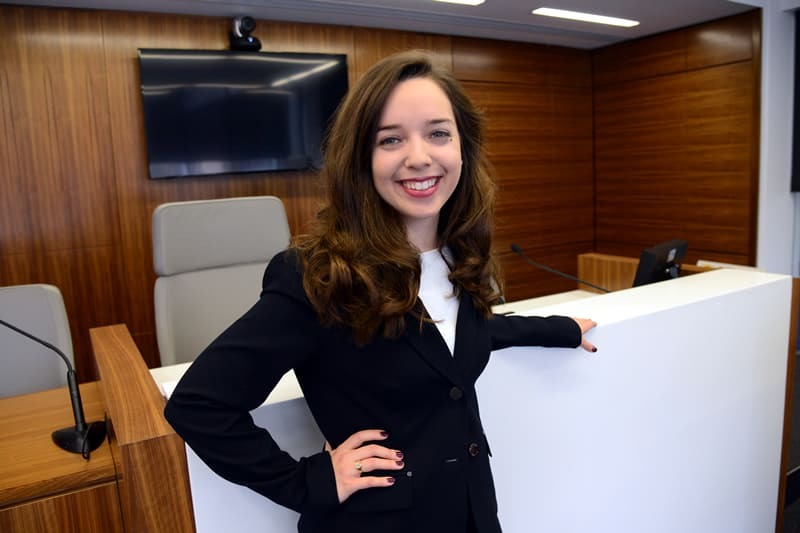 LaRiviere sees her collective law school experiences as preparation for her intended career in public service.